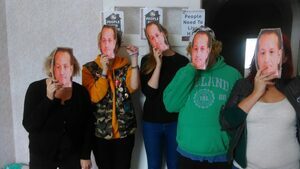 Posted in Misc and tagged kindness, Waterford at 9:31 am on February 22, 2019 by Bodger. 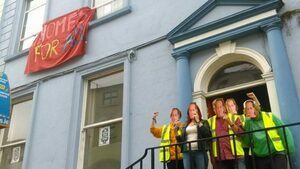 A building has been occupied by a group of housing activists on O’Connell Street. 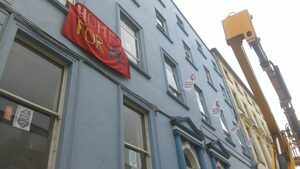 Following another increase in the number of homeless people, activists in Waterford have said enough is enough and initiated a 24-hour occupation of a vacant building on O’Connell St. The building is the former Presbytery now owned by Waterford City and County Council. 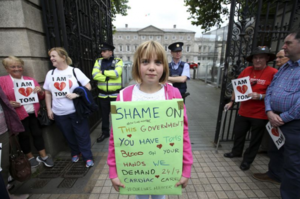 This follows a summer of occupations in Dublin. Meanwhile, a public meeting will take place on Thursday, September 13, at 7pm, in the Unite Union Hall, Keyzer Street in Waterford. Speakers on the night include PBP Rep Una Dunphy, Michelle Byrne, USI Vice-President for Campaigns and an activist from the Dublin Summerhill Occupation and United Against Racism. 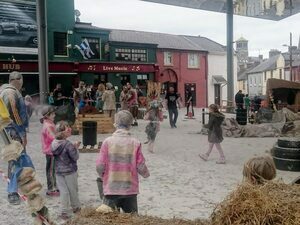 Posted in Misc and tagged Occupation, Take Back The City, Waterford at 3:25 pm on September 7, 2018 by Bodger. Posted in Misc and tagged dog, Sup?, Waterford at 3:42 pm on August 29, 2018 by Bodger. “In the distant future, the year 3017, war has broken out. In order to claim the origins of the all mighty blaa, clans from around Waterford blaa-ttle it out. 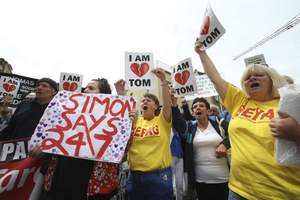 Under the canopy of the Blaa-Apple Market groups of estranged blaa-ttlers will gather. 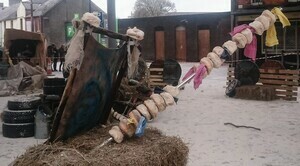 They have dropped their shields and swords and have picked up the flour and eggs for a display unseen before…. The Battle of the Blaas! 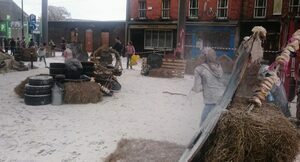 Blaa-mageddon a family fun egg and flour fight, part of The imagine Arts Festival 2017…Fake FUN Fight! Posted in Misc and tagged flour, Waterford at 4:33 pm on October 23, 2017 by Broadsheet. 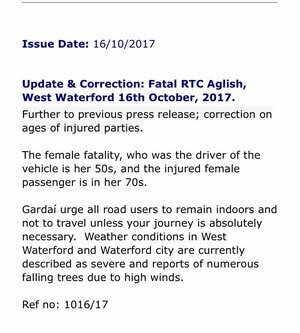 It’s being reported that a woman, in her late 70s, has died after a tree or large branch fell on her car near the village of Aglish in West Waterford. She was the sole occupant of the car. Damien Tiernan, of RTE, reported in the past few minutes. 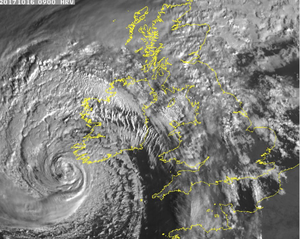 Posted in Misc and tagged Aglish, Ophelia, Waterford at 1:03 pm on October 16, 2017 by Broadsheet. On Saturday, September 16, at 10am. A 5km memorial run to honour the four Rescue 116 crew members who died in March – Captain Dara Fitzpatrick, Captain Mark Duffy, Winch Operator Paul Ormsby and Winchman Ciarán Smith – will be held. Proceeds from the run will go to the children’s charity Touching Hearts and South Eastern Mountain Rescue Association. 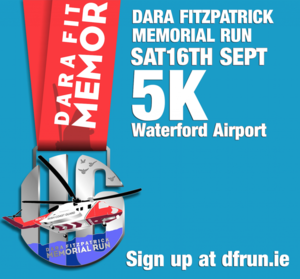 The Dara Fitzpatrick Memorial Run has released details of their run finisher’s medal. The medal depicts a Sikorsky S92 Helicopter flying over the sea on a rescue mission. In the background are the numbers “116”, together with four flying doves honouring the lost Rescue 116 crew members. Those wishing to take part can register here. Posted in Misc and tagged 5km run, crew members, Rescue 116, tribute, Waterford at 9:56 am on August 18, 2017 by Broadsheet. 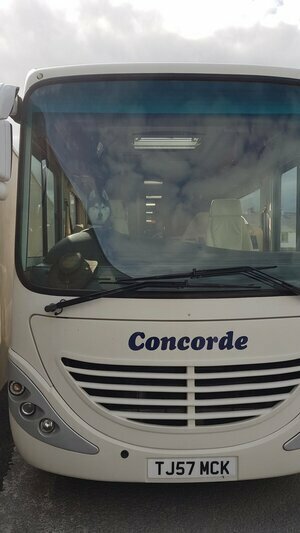 Posted in Misc and tagged arrest, cannabis, Waterford at 10:28 am on August 9, 2017 by Broadsheet. Farmer and father-to-be Thomas Power died in an ambulance near Dungarvan, Co. Waterford, as it was travelling to Cork two weeks ago. 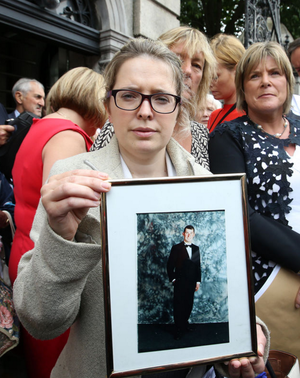 At the time of this death, the catheterisation lab in University Hospital Waterford (UHW) was closed for the weekend. It’s open for cardiac tests and procedures Monday to Friday, 9am-5pm. 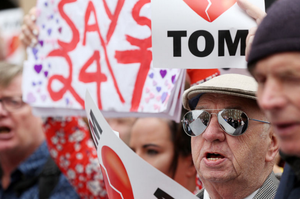 Thomas had suffered a heart attack. 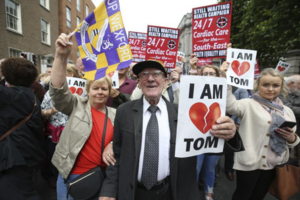 Further to this, friends and family members – including Thomas’s sister Catherine Power, above – gathered outside the Dáil this afternoon calling for 24/7 cardiac services in the area. Posted in Misc and tagged Dail, protest, Thomas Power, Waterford at 4:58 pm on July 4, 2017 by Broadsheet. 01. Acting as both a name for their collective creative endeavours and an umbrella for their solo work, Waterford beats co-op Sons Phonetic is comprised of Rabiah “Mook” Zaruq (aka Nylon Primate), Sammy Dozens, Tommy Tyler, Ian Kav, Mouse Hughes and DJ/cutman Tom Dunne. 02. This past weekend, the collective’s first collaborative release since 2011 debut album Twelve Labours was released, entitled Deloreans. 03. 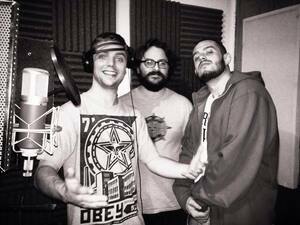 The self-produced LP features cuts from UK skratchologist Moschops and Corkonian hip-hop godfather JusMe. 04. The album is streaming in the widget above, and available for download via their Bandcamp, along with several of the members’ solo releases. Thoughts: Proper, boom-bap production and clinical, precision wordplay. Decent Irish hip-hop™, indeed. Posted in Music, You May Like This and tagged boom-bap, hip hop, Ireland, new Irish music, new music, Waterford at 10:00 am on May 8, 2017 by Broadsheet. 01. Alt-rock is the order of the day for Waterford five-piece Ghost Robots. 02. 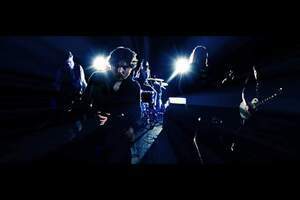 Formerly known as We, the People, the band rebranded in 2015 and releasing their Sell It to Me EP. 03. Streaming above is the lead-off single for same, Under Fire. 04. Catch ’em at home tomorrow night, playing creative space The Bearded Lady on Michael St. BYOB show, so no glass, no trackies, etc. Thoughts: A lot here for fans of the broader church of alternative sounds and references. Posted in Music, You May Like This and tagged alternative, Ghost Robots, Ireland, new Irish music, new music, Waterford at 11:22 am on March 30, 2017 by Broadsheet.